Cover Description: Booster Gold stands over the bodies of his fallen teammates. Brief Synopsis: The Justice League International struggles to recover from a surprise bombing at the United Nations. 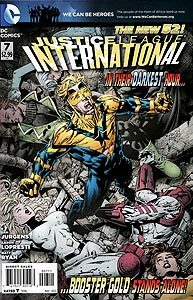 Issue Summary: Booster Gold and Guy Gardner are the only two Leaguers still standing after a bomb was detonated during their official presentation ceremony at the United Nations building in New York. The pair work together to recover their incapacitated teammates and injured bystanders. When Batman joins their efforts, Gardner attacks the energy creatures that arrived after the blast. Unknown to all, a mysterious figure named Lightweaver is responsible for both the bombing and the energy creatures. Lightweaver is prevented from finishing off the fallen Justice League International by an unseen master. Shortly after Booster finds a severely wounded Ice, August General in Iron emerges from the flames with the deceased body of Rocket Red. Recognizing that the situation is dire, Batman leaves to hunt down whoever is responsible for this situation, leaving Booster to discover that Andre Briggs and Emerson Esposito were also killed in the explosion. Booster Gold emerges from the flaming aftermath of an assault on the United Nations Building, as seen in the previous issue. He is holding the unconscious body of his teammate, Fire. Guy Gardner has also survived the bombing relatively uninjured, and is already evacuating injured civilians. Meanwhile, several "energy creatures" have appeared and seem content on spreading mayhem. Batman, who was not among the heroes at the public unveiling of the JLI as seen last issue, joins the survivors with a weakened Godiva. When Batman comments on "a miracle" that saved Godiva from the blast, is he being sincere, or skeptical of Godiva and her savior, August General in Iron? POWER UP: Ice is the next injured Leaguer found. She complains about her legs, and Booster creates a force bubble to carry her to safety. Booster is able to maintain a force bubble around himself as well, thereby demonstrating far more control over the shape of his force field than ever before. FASHION ALERT: In this panel, the "W" is missing from Booster's neckline. Also, Nowhere in this book is there any gold on Booster's cowl as shown in Jim Lee's template and on this issue's cover. Are these art errors the fault of the penciller, inker, colorist? One of the four editors credited on this issue must know! Naturally, after the traumatic events following the bombing, Booster Gold reaches out to his family and calls Skeets. For the second time in this series, Skeets is heard but not seen. 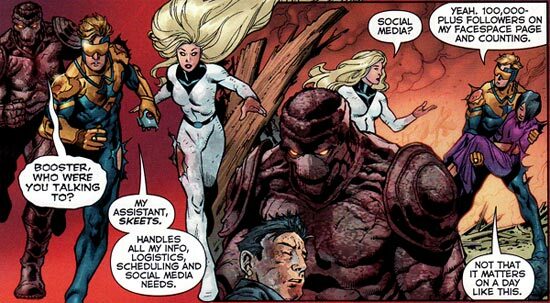 Booster Gold claims to have "100,000+" Facespace followers. "Facespace" is obviously a play on the two most popular social networking websites of the past decade, Facebook and MySpace. For a bit of comparison, at the time of this issue's release, DC Comics had 544,000+ followers on Facebook (and Boosterrific had 14). Following the disastrous events of the recent issues, Chairman Bao of the United Nations disbands the Justice League International. POWER DOWN: Booster is wallowing in his frustration and self-pity when he is attacked by Lightweaver. The art in the panel does note make it clear whether Lightweaver's energy construct cuts through Booster Gold's force field or whether Booster intentionally lowers his field in order to shoot his Booster Shots at the construct. Boosterrific Review: It's hard to believe anything that happens in this issue. DC Publisher Dan DiDio has said that death is a permanent state in the New 52. If that's true, the line-up of the JLI is about to change drastically. And it's only issue 7! This is a dramatic and exciting start to the second story arc of the series. I....I did NOT expect ANY of this. I feel like I need to find a dark hole to wallow in. (As a note, I'm still 'new' to comics, so death in them still shocks me). Having seen all the Batwing related pictures in the next issue covers, I had assumed it was Vixen biting the dust, not...not...*sniffle*. I found it very shocking and had to take breaks just to let it sink in. Gotta say, Jurgens knows how to write.